My middle toe resembles MaryEllen's 2nd toe but just prior to it leaning I felt an excruciating pain in the mid section of the ball of my right foot...and that lasted about 3 days but gradually went away within a week. After that I noticed the toe leaning flush with the one next to the big toe. I can't move it independently anymore as I used to have a lot of flexibility in all my toes this feels weird to me. It acts in unison with the toe it's now leaning on. After a long day of driving a bus my foot is achy and tired on that whole front part of my right foot. This painful circumstance happened about 3 months ago. My Xrays from a year ago show that those two toes, next to the big one, are the same length to the knuckle. On the outside they are a nice slant down to the pinky toe so I had no idea they were the same length?! My doc says he could go in and cut the bone of the middle toe to give it that natural curve of the joints to the pinky, and that that's what was aggravated and did something to the bottom of my fleshy part of that foot...can't remember the exact details. sorry. I finally yesterday taped my right 3 toes of that right foot together--straightening that slanted middle toe (took 3 tries to get the right tension, lol) and it actually has felt normal all day! Can I or should I just live with taping it rather than surgery and possible scar tissue (which I do badly). I can handle taping...will get old, but beats not knowing what's in store. So is that ok for the LONG RUN? Thanks for your expertise, Dr.
You are not having any real pain, just an achy feeling which seems to be relieved with taping. You state you can no longer bend your toes like you used to. Well....unless you play the piano with your toes there is really no need to have that much motion in your toes. Additionally, you need to find out what caused that severe pain in the ball of your foot that lead to the second and third toe moving more in line with the big toe. My guess would be either you tore something like one of the tendons that goes into the toes and thus "released" them on the outside allowing them to drift towards the big toe, or some kind of growth started to develop in the ball of the foot which then forced the second and third toes closer to the big toe. The thing that is puzzling is that you state the pain in the ball of the foot has subsided, which means at least, there is probably no growth there as growths just do not disappear and stop causing pain. So I am leaning more towards a tendon tear. Now, I am not sure what your doctor is offering you in terms of surgery to make the foot look better but my rule for surgery is fairly straight forward: if you are having pain and nothing else has helped, then consider surgery. Never have foot surgery for cosmetic reasons as rarely does this work out. What appears good on the "drawing board" usually does not translate well in actual surgery. Lastly, your doctor would need to find out what caused the severe pain in the ball of the foot, probably with an MRI and then have to determine if whatever was going on also needed to be repaired. My guess would be that it would have to be repaired. 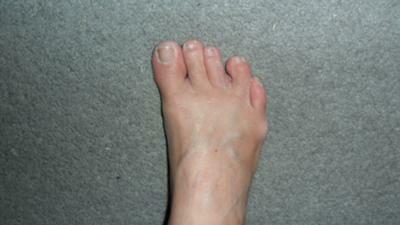 Comments for after ball pain, middle toe leans against neighboring toe. oops, commented on the wrong topic?! I'm great on the computer that way, lol! And I'd count it a privilege to meet you, Doctor. I go to Nebraska for awhile in the summertime to visit my granddaughters...and escape the heat. I really appreciate you taking the time to read my post and offer your opinion! I value it since you don't stand a chance of my becoming a patient and thus don't stand to make any $$ off of me since I live in Phoenix. My local foot doctor suggested shortening that middle bone, but that never made sense to me. At first he'd suggested I'd blown a tendon, but that was before another doctor (who'd seen me the year before and injected Cortisone into that ball area for pain) reminded him of the long toe bones. These guys used to work together but no longer do. Anyways, I know I should probably let them MRI the area just to make sure, but as you said, I have no pain, so there's probably not a growth, which makes sense to me. Until and unless I experience pain again, I'll tape it up on and off in 24 hour increments, as today I went tapeless, after yesterday taped all day, and it feels fine. Thanks for saving me from unnecessary surgery! God Bless and have a happy EASTER! It comes down to commonsense. Not every thing needs to be fixed. If you are not in extreme pain and you are getting by, then leave well enough alone. You see, at the end of the day, your doctor could not guarantee that the surgery would solve your problem nor can he guarantee that the surgery itself would not cause problems. Don't be too sure about me not making any $$ off of you because you live in Phoenix. We vacation in Scottsdale every year. Good luck!